Lockport, N.Y., police Sgt. Kevin Locicero, left, and Niagara County Sheriff’s Capt. 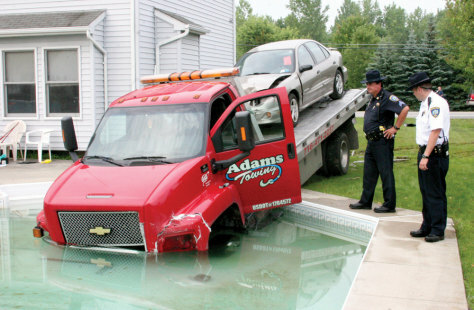 Bruce Elliot examine a flatbed tow truck July 30 that drove into a swimming pool the previous night. Police said the Buffalo-area driver was juggling two cell phones, texting on one and talking on another, when he slammed into a car and crashed into the swimming pool.